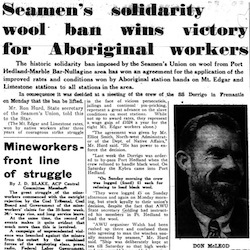 The wool ban, imposed by the Seamen’s Union on 1 July 1949 and lifted on 18 July, involved two vessels, the State Ship Dorrigo, which bypassed Port Hedland, and the State Ship Kybra, which was held up for two days by the ban before wool was loaded. 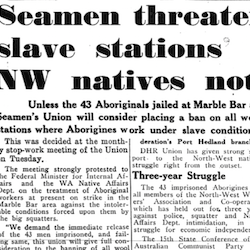 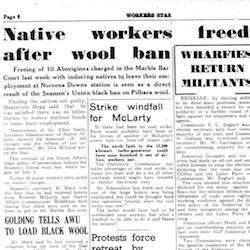 The ban was weakened by lack of support from the Australian Workers’ Union, as this report, written by McLeod and transcribed by Hurd, shows. 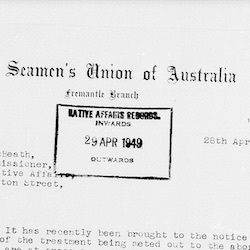 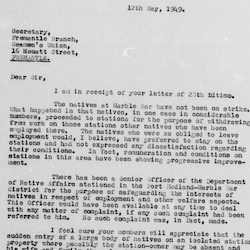 Report by D.W. McLeod on AWU scabbing on wool ban occasion 1949, in Hurd’s Notes, Papers of Don McLeod, State Library of Western Australia, MS 5121A.